Getting the best traveling deals is like trying to bust a cheating partner, it’s the first thing you do in the morning and the last thing you do at night – research. If you’re like me, you’ve heard people say time and time again that it’s expensive to travel to and enjoy Hawaii. Well, I’m here to say, yes, it can be expensive but only if you don’t take the necessary steps to avoid the extra costs. My family’s trip to Oahu, Hawaii took place in the beginning of December. To avoid holiday rates, I aimed to vacation during the first half of December. According to Perfect – Hawaiian – Vacation, “High” season (mid-December to mid-April) tends to be the most expensive part of the travel year in Hawaii. Stalk airlines for a few weeks to get the best airline tickets possible. If I know a trip is coming up, I generally start searching for travel deals 2-3 months before the vacation. Since I was aiming to vacation in early December, I started searching for deals in September and purchased my airline tickets in October. 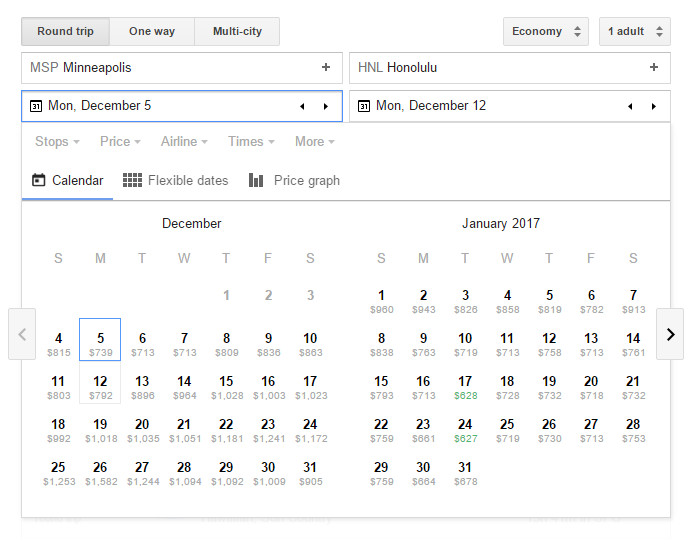 I recommend visiting GoogleFlights because the site allows users to compare ticket prices in a calendar view. I like to search for tickets to buy on a Tuesday or Wednesday before 9 AM and after 9 PM because I’ve found this is when tickets are cheaper. I was able to purchase 4 round-trip tickets with United Airlines from Minneapolis, Minnesota to Honoulou, HI (with an hour layout each way) for less than $500 each! The next day, I checked ticket prices again and they were at least $200 more than what I got them for. Score! Avoid staying in hotels and touristy areas. Unless you’ve got the cash to burn for a pricey hotel suite you’re hardly going to be in, aim for place that will leave you with enough money to buy nice souvenirs. My vacation party consisted of 6 people (1 couple, 1 grandmother, 2 grandchildren, and an uncle). My goal was to spend $200 – $250 a day on a rental home near the northeastern coast (about a 25 minute drive from the airport). After searching Airbnb.com and VRBO.com for available rentals, we picked a 3 bedroom home in a quiet neighborhood with 1 bathroom, 2 – 1/2 bathrooms, a splendid mountain view in the back yard, and an ocean view in the front on VRBO.com for about $210 a night. The location of the home was near a lot of the attractions we wanted to visit and had a gated/locked fence so we could park our rental car on the rental property with a bit more peace of mind. If your’re planning on buying souvenirs for family, friends, and co-workers, I’d recommend stopping by the Aloha Stadium Swap Meet & Marketplace – which is located not too far from Pearl Harbor. The swap meet is located outside the stadium in one of the parking lots and is open Sundays from 6:30 AM – 3 PM and Wednesdays/Saturdays from 8 AM – 3 PM. Shoppers can buy lots of traditional souvenirs for a fraction of the price they would typically costs at another tourist gift shop. I got Hawaiian shirts for the men in my family for $10 each and pretty sarongs for about $5 each.